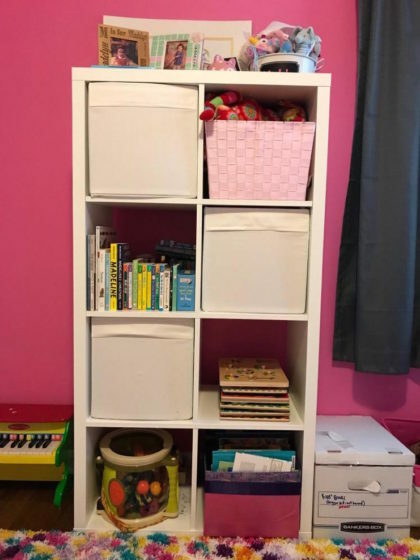 For those who haven’t heard of it, you have definitely seen an IKEA Kallax (formerly known as Expedit) shelving unit around somewhere. This wonder of a shelving unit comes in various combinations of 13 x 13-inch cubes* and in various colors: black, white, birch, walnut, and black. The cubes are larger than most other cube shelves, The panels are thick and the cubes themselves are deep (15.75 inches). Though you must assemble them yourself, the cubes are sturdy and lightweight, which makes them easy to move around. Unlike some other IKEA furniture, the lifespan of Kallax may as well be decades (I’ve owned a few of them for 12 years + and have moved with them at least six times). The Kallax has a natural and limitless potential for organization! 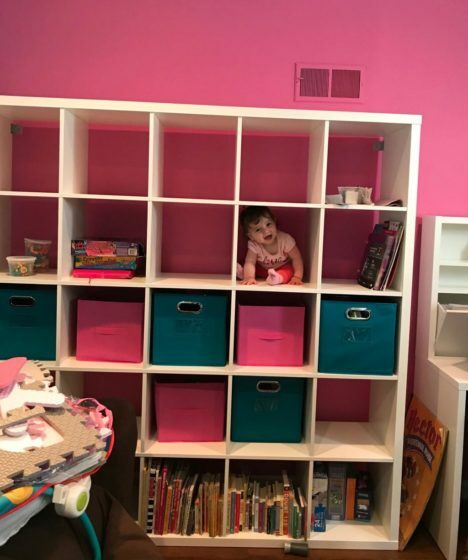 You can use the cubes to store books, clothing, toys, tools, towels – you name it – in your living room, playroom, bedroom, or kitchen. The Kallax itself is aesthetically quite pleasing, but you can also buy storage bins or boxes to coordinate with your other furniture (rugs, curtains) in terms of color and design, to disguise personal items, and to keep things looking even neater. Storage boxes and bins are available everywhere, such as Amazon, Wayfair, Overstock, Walmart, and of course, IKEA, including the perfectly fitting 13 x 13-inch collapsible bin. The bins can range in price from $1 to $20+ per bin/box. 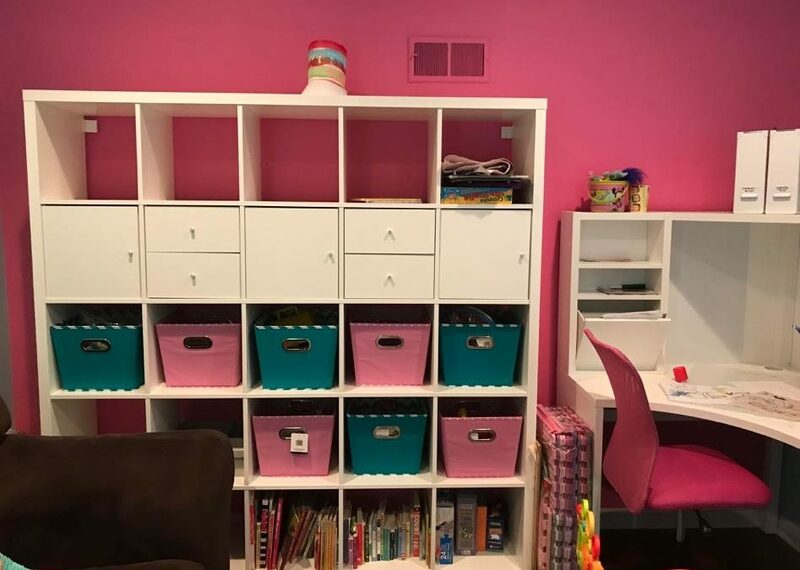 IKEA has even given us the ability to transform the Kallax into a more “upscale” appearing piece of furniture with optional built-ins like two horizontal drawers and doors for some or all of the cubes. The symmetric nature and simple design of the Kallax mean it’s possible to place the assembled shelf in different orientations to serve different functions. For instance, the 2 x 4 cube option either horizontally (approximately 30 inches high and 57 inches long) or vertically (57 inches high, 30 inches long). The horizontal positioning is great for storing kids’ toys, placing under a window, or even using as a room divider. 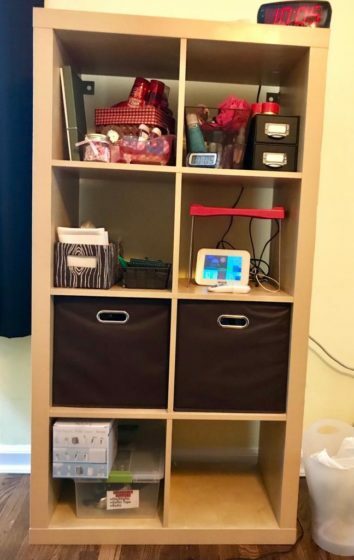 Whereas the vertical positioning is great for maintaining organization in smaller spaces, for putting belongings on display or keeping them out of reach of curious toddlers. It is important to secure any cubes to the wall if you have small kids around who like to climb! I almost forgot to mention, these glorious shelves range from $39-$180 depending on the size, and whereas IKEA used to require in-store pickup, you can now have items delivered for as low as $9. For many, this is well worth avoiding a trip to an inconvenient IKEA location and spending a few hours searching for items and pushing around a hand truck, although I’ll admit their $1 ice cream is fantastic. I love these storage units. They are also great if you are a scrapbooker because it accommodates 12×12 paper and the box it comes in. Judy, thank you for pointing out the usefulness of Kallax for scrapbook (and crafting) enthusiasts! !